Reunion at Bangsar Village II is very refined and personally, slightly intimidating. Its modern oriental décor greets you as you step into the restaurant. 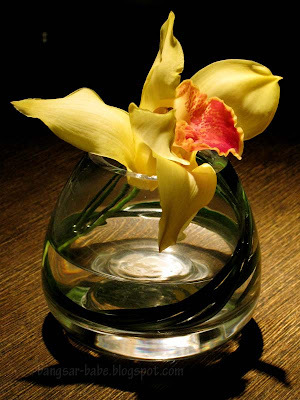 Everything is meticulously planned, from the embroidered menu cover right down to the floral centrepiece. rif and I treated his sister and her new husband to brunch to congratulate them on their wedding. Service was attentive, not intrusive. I liked that I didn’t have to wave till my arms fall off just to get their attention. The Roast Meat Combination (RM34.80) did not live up to its hype. 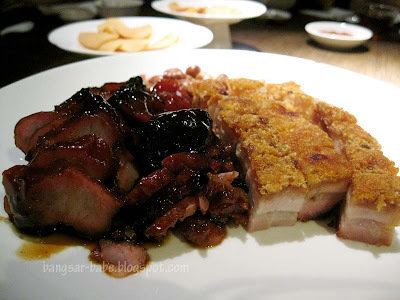 Despite its glossy sheen and sticky sweet coating, the char siew was much too lean and missing the charred sides. 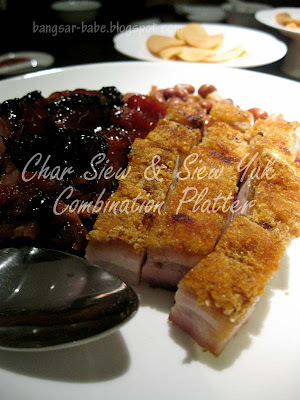 The siew yuk was at best, mediocre – the skin wasn’t crackly nor crisp, and it had more lean meat than fat. Simply put, it did not send me to porcine heaven. 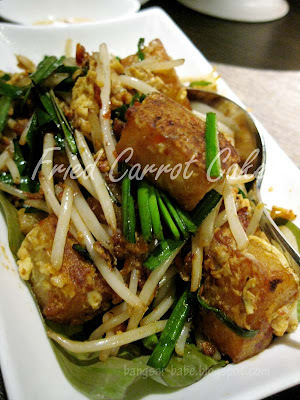 The fragrant vegetable tofu (RM28.80) comprises spinach and egg bean curd, which are deep-fried till golden brown and topped with light gravy. This would have scored higher, had it been served hot. When it arrived at our table, the tofu was barely warm. 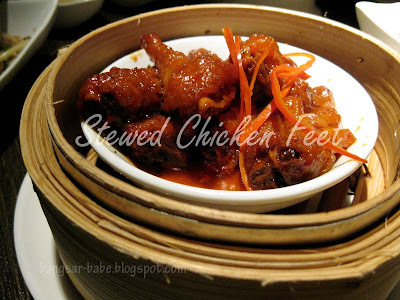 That aside, the bean curd was smooth and lightly flavoured, and the light gravy with minced meat paired nicely with it. Since we were all famished, I ordered quite a few dim sums and a plate of their much talked about Hokkien Mee. 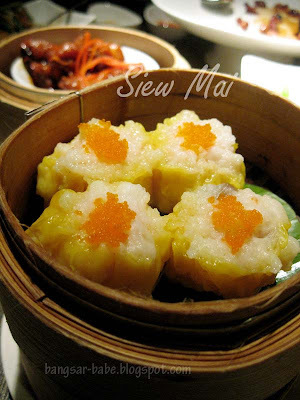 The Siu Mai (RM7.80) was decent. Daintily wrapped and topped with bright orange fish row, it was porky and moist, with a slight crunch. 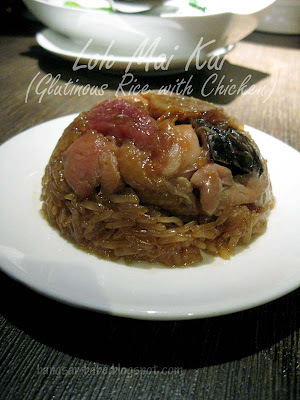 I tend to be sceptical about Har Gao (RM8.80), because most of the time, it arrives starchy, thick and powdery. Reunion fared better, but it wasn’t great. The skin was not overly thick, but it wasn’t ideally thin either. While the prawns were fresh, I couldn’t really taste the sweetness in it. 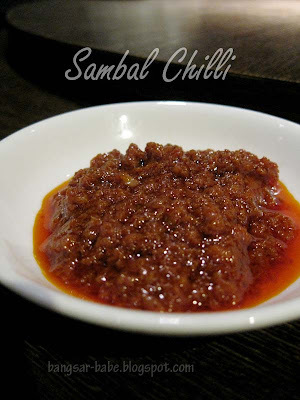 The loh mai kai (RM6.80) was Ben’s order; I didn’t try it so I can’t comment on this. Both rif and his dad’s facial expression went from excitement to confusion when they took a bite of the steamed BBQ buns (RM6.80). I tried it, and knew exactly why they had that reaction. The pork filling was extremely porky, and not in a good way. It’s probably type of pork they use, because the pork in UK tasted similar. 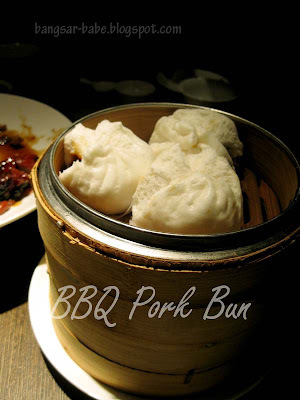 Tastewise, the filling was flavourful and the bun was fluffy. So I can’t fault them on their technique or ingredients. 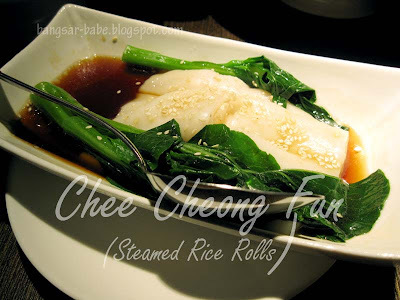 The chee cheong fun (RM8.80) was nothing to shout about. Again, the prawns lacked crunch and sweetness, which knocked a few points off the dish. 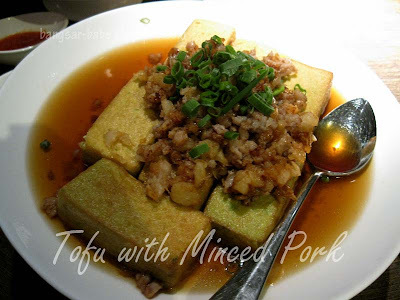 Fried radish cake is a must order whenever I have dim sum. 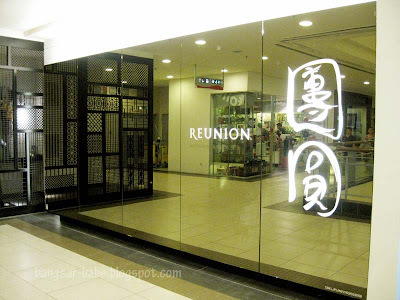 Reunion’s version (RM8.80) had thickly cut radish cake, fried with plenty of chives, beansprouts, eggs and dried shrimp. Not bad, but not great either. 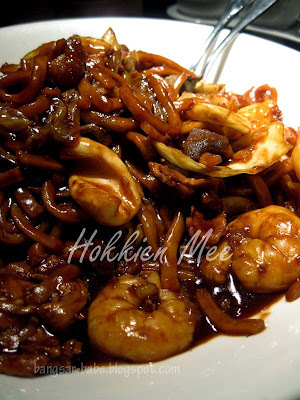 I’ve heard so much about the Hokkien Mee (RM26.80), especially from those hot shot people I meet at events. To be fair, this was not bad for a restaurant version. But to say it is the “best Hokkien Mee” ever, I have to disagree. Yes, it was quite good, but it didn’t blow my brains out. And it didn’t have that grunge, hawker feel that makes a great Hokkien Mee. rif’s mum makes a damn good version of Hokkien Mee too. So why should I spend so much moolah on something his mum makes better? (No auntie, I’m not trying to score brownie points!) Stewed chicken feet (RM6.80) is an acquired taste to some, but I like eating it, only if it is cooked with black bean paste. The deep fried yam puff (RM6.80) was not bad. 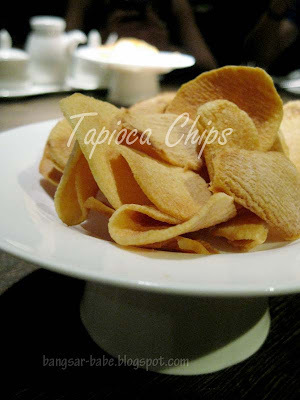 I liked the savoury pork filling, and it has a light and crunchy coating. 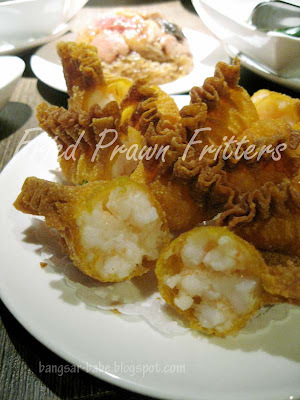 The same could not be said about the fried prawn dumplings (RM8.80) — the skin was thick, hard and chewy, while the filling was tasteless. No amount of mayonnaise could help save the dish. 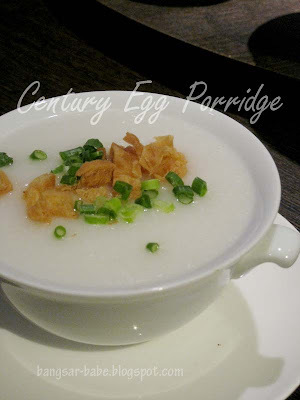 I also didn’t try the century egg porridge (RM6.80), but rif’s mum said it was average. 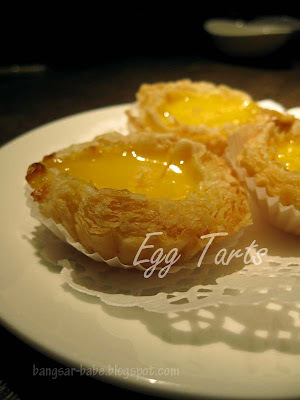 Egg tarts are one of the few items that test the chef’s skill. Sadly, Reunion didn’t pass this test — not even close. The tarts (RM6.80) should be firm, yet fluffy enough to crumble in the mouth, but the one I had was way too oily with a hard, gloppy egg custard filling. I found the food average and the pricing exorbitant — definitely not worth the hoo haa. I’d come here again for the lovely ambiance and service, but not so much for the food. Verdict: The food is decent, not great. But note that prices are on the high side. Cheers girl… Have a BLESSED CHRISTMAS 🙂 Enjoy the weekend! Best wishes from Abu Dhabi … and Dubai! Charging tht prices jz cos of its location is understandable mayb to some, but doesnt make for a good excuse. At least give us quality food. 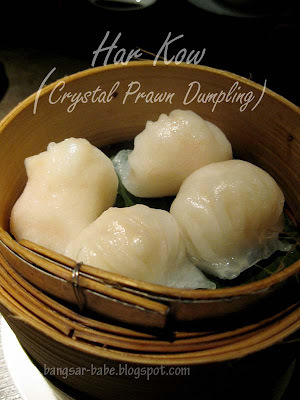 anyhow, I came once & I do think for the same price I can get better dim sum with the same ambiance & service. Nice looking dim sum, being in BV, it'll hurt the wallet a bit. Nevertheless, if it's good, no harm giving it a try. Michael – Merry Xmas to you too! nomad – Well said, my dear! Julian – Merry Christmas to you too! Sounds like mediocre only. Though this place was rather hot back then, reviewed incessantly. Nothing beats good old Ipoh dim sum, I'd reckon? 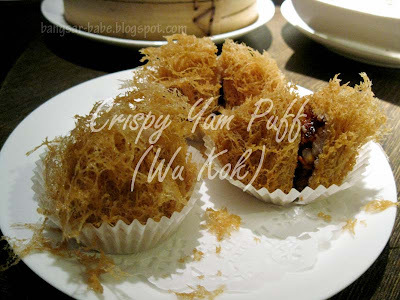 J2Kfm – Ipoh dim sum tastes much better, and cheaper too!